Thank you. These are great resources. We're currently working on expository and technical writing in my classes. The TAG students have this year don't particlarly know how to use graphic organizers because they are "project driven." They're former teacher did not explain much else than those two buzz words. September 3, 2007 at 3:45 p.m. 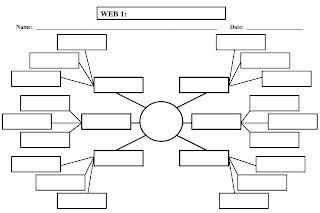 Web 1: charts are the best way I have found for advanced planning an event consisting of manny separate activities and a large staff of people. I allows you to spell out every activity you wish to have and then find out if you have enough staff and equippment or need to find some. May 14, 2008 at 3:39 p.m.
April 9, 2011 at 10:46 a.m.